When a subordinate chimpanzee grooms a dominant one, it often does so for a long time and unsolicited. When it then requests to be groomed in turn, it receives only a brief grooming and usually after having to ask a second time. This gorgeous little juxtaposition of tales comes from a new book by Dario Maestripieri of the University of Chicago, who is both a professor and a primatologist (and a primate). 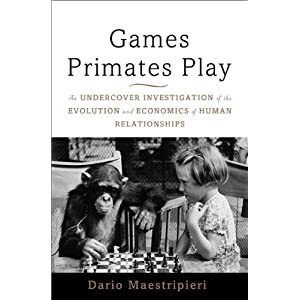 His book, called "Games Primates Play," is devoted to ramming home a lesson that we all seem very reluctant to learn: that much of our behavior, however steeped in technology, is entirely predictable to primatologists. He observes two university colleagues in a coffee shop and notes how the senior one takes the chair with the back to the wall (the better to spot attacks by rivals or leopards), is less attentive to her colleague's remarks than vice versa, stares down her colleague when a contentious issue comes up and takes the lead on walking out the door at the end-all of it neatly corresponding to the behavior of two baboons when one is dominant. Dr. Maestripieri's most intriguing chapter is entitled "Cooperate in the Spotlight, Compete in the Dark." He describes how people, like monkeys, can be angels of generosity when all eyes are on them, but devils of spite in private. Famously, the citizens of New York City turned to crime when the lights went out in the blackout of July 13, 1977-not because they were evil but because the cost-benefit calculus was altered by the darkness. Dr. Maestripieri then offers a fascinating analysis of the conundrum of peer review in science. Peer review is asymmetric: The author's name is known, but the reviewers remain anonymous. This is to prevent reciprocal cooperation (or "pal review"): I'll be nice about your paper if you're nice about mine. In this it partly works, though academics often drop private hints to each other to show that they have done review favors. But peer review is plagued by the opposite problem-spiteful criticism to prevent competitors from getting funded or published. Like criminals in a blackout, anonymous reviewers, in the book's words, "loot the intellectual property of the authors whose work they review" (by delaying publication while pinching the ideas for their own projects) and "damage or destroy the reviewed authors' property" (by denying their competitors grants and publications). Studies show that peer reviewers are motivated by tribal as well as individual rivalry. Says Dr. Maestripieri: "I am a Monkey-Man, and when I submit a grant application for peer review, I am terrified that it might fall into the hands of the Rat-People. They want to exterminate all of us…(because our animals are cooler than theirs)." His answer (and it applies to far more fields than science) is total transparency with the help of the Internet. The more light you shine, the less crime primates commit. Once everybody can see who's reviewing whose papers and grant applications, then not only will spite decline, but so will nepotism and reciprocity. Anonymity alters the cost-benefit balance in favor of competition; transparency alters it in favor of cooperation.